I met the boys’ dad in the spring of 1997. He wore shorts on our first date, and when I asked him how he got the large scar on his knee, he said he fell while pretending to surf on a moving Volkswagen. That was a good one, he said. You could see down past the muscle, and his mom almost passed out in the Urgent Care. He doesn’t have a scar from when he fell off the high dive that one summer in the 70s, and I can’t remember how many bones he has broken. I just know he is accident prone. He went to the Urgent Care a week ago Saturday. He was in the garage and stabbed himself with an old, rusty instrument. You can see the scars on Nico’s knees when he wears shorts; there are more on the left than on the right. He was a little over a 18 months old the first time I took him to the doctor for an injury–he fell face first reaching for a toy–and six months later busted his lip on a flying plastic dinosaur. 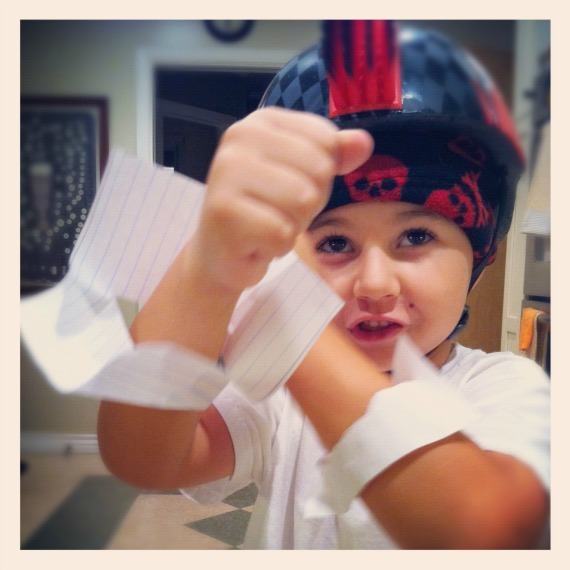 He came home with more boo-boo reports in his first year of preschool than Mikey has his entire academic career. I would fear where this is going if I didn’t admire him so much. He makes us laugh. He makes wry observations and is confident he is amazing. We can’t argue with him. “Mama, I’m the Dominator of scooter riding.” “Mama, I am the Dominator of this Lego set.” “Mama, I am the Dominator of eating pizza.” When he smiles, his eyes turn into little triangles. I love to make him laugh; it sounds like wind chimes. Everything is fun. 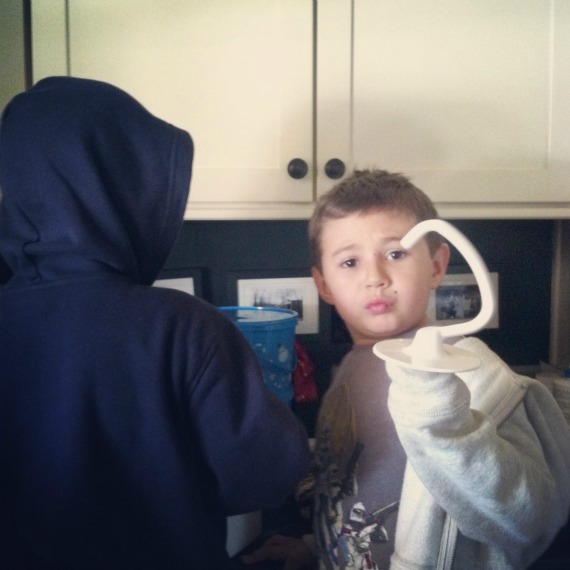 When we bake cookies, Mikey follows the recipe to the letter while Nico pretends to be Captain Hook. Everything is awesome. Play-dates are awesome. The dentist is awesome. School is awesome–except for a two week period when he had to accept he wasn’t going to be learning about space full-time. I had to explain to him that even Neil Armstrong had to learn how to read. Unlike Mikey, who communicates what he is feeling like a tiny Sigmund Freud, Nico fumbles around words and takes forever to make a point. He prefers to rely on a bundle of sound effects. He laughs hysterically when something is only moderately funny, and just as easily cries at the drop of a hat. 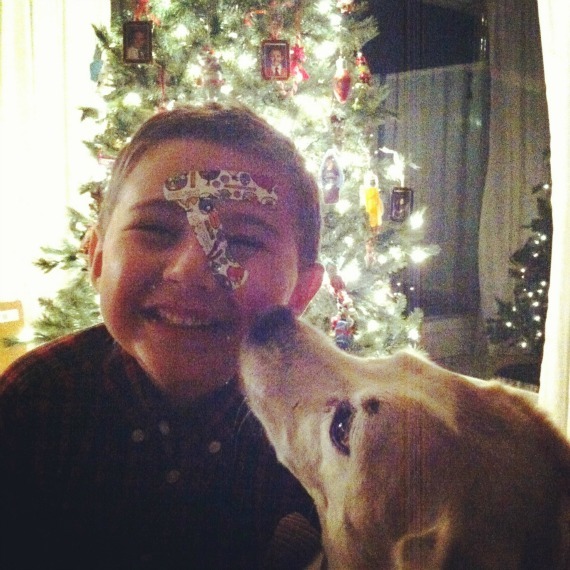 His world nearly crumbled the day I said he couldn’t wear his favorite green sweatshirt to church. 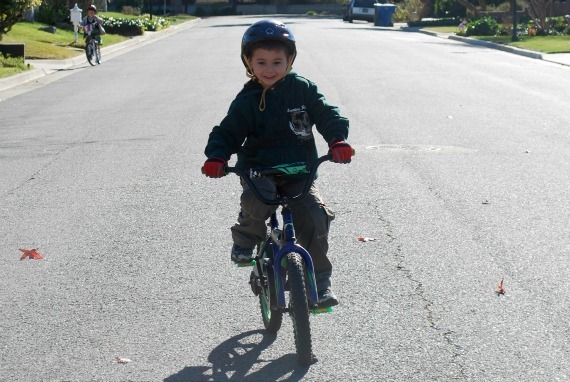 He learned to ride his bike over the weekend. He screamed the entire time. The entire time! I could hear him from down the street, inside, with the windows shut. He is very shy around adults he doesn’t know. He is honest to a fault, which is why the other night at dinner, in the middle of a busy restaurant, he stopped in mid-sentence and said, “Holy cow, I just farted!” My dad and brother laughed until they cried. He is visual, like his dad. He knows the make and model of all his friends’ cars and when he gets bored in the car he likes to call out the makes and models of the cars on the street. His dad is the same way. He can identify a car in the dark just by the shape of the headlights in the rear view mirror. It’s uncanny. Nico was upset until he stopped bleeding. Once the band-aids went on he was thrilled. We sent him back to school after Christmas break with an almost clean face. 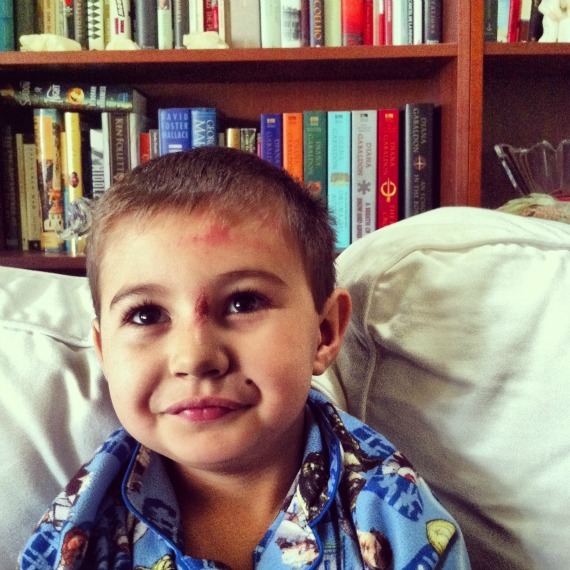 The scabs on his forehead were gone, but he had a small patch of pink, freshly healed skin on the bridge of his nose. One the second day of school, the front office called me. Nico tripped over his own feet and landed face first on the asphalt. He fell hard enough that they wanted me to take him to the doctor. I explained to the pediatrician my concerns, that it was in the same spot as his injury two weeks ago. He did some cognitive and physical tests, and it was when the he said, “His skull appears to be intact” that I accepted the kind of son Nico is going to be. On Saturday we let the boys play around the church breezeway as we chatted with a few parents. 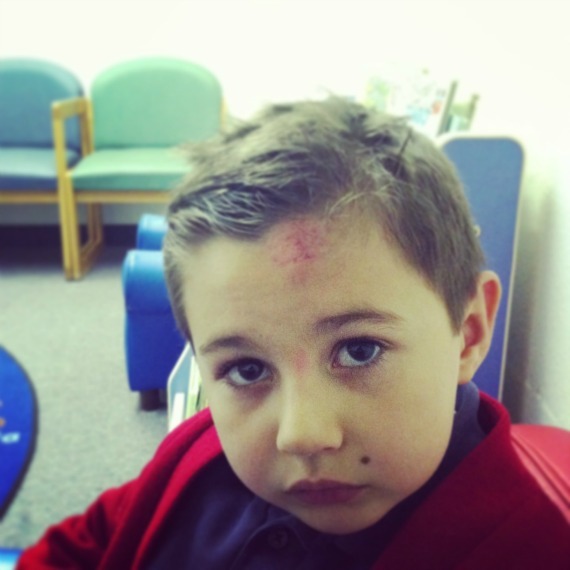 As we turned to go, Nico fell off a curb and landed, face first, on his much abused forehead and bridge of his nose. Thank you for being so refreshingly honest in all your posts! I especially enjoyed this one because your Nico and my Bella must share the same genetic code for falling, getting up, crying and laughing. I keep band aids/plasters in every purse and wallet just in case and there is a first aid kit in the cars and on each floor of our house. We have slate floors downstairs and her last tumble, while I was in the kitchen, was on her noggin as she fell from the arm of the armchair. there was such a loud thunk that I was sure that there was permanent scarring and blood. Neither happened and i nervously checked pupils, bumps, bruises, and so forth…and now that she’s 4, I’m slowly accepting that she will always trip on flat ground and run like the wind over all bumps. Thanks again for your lovely posts! There have been so many loud thunks with Nico! I’ve lost track, truly. You would think I’d be used to it, but nope! So stinkin adorable. what a great couple of kids! God bless you, your are earning your parenting stripes. No matter how many times its happens, it is hard to see your little guy get hurt. I loved your description of Nico’s eyes becoming triangles. Made me go back and look at each picture. Your family is so dear. I am encouraged by your daily walking. Keep it up, don’t you wonder how great you will feel at the end of the year? I hope by the end of the year I feel great! I’m counting on it. One of my favorite posts! What a blessing each child is in all their glorious weirdness. I’ll just say it…. I love your kids LoL they are awesome! Speaking of love, what is it with boys and farts? I mean, really. Although, I’m hardly one to judge. I am the one whom, on a blind date, while watching Along Came Polly, got so tickled at “sharted” I could not regain composure. My date did not see the humor. Needless to say, it was our first and last date . . .
Mikey is such a #1! I have one of those boys too – he’s now 16 & 6’2 with a grin the size of Texas that makes the world a happy place. Brought back memories of similar escapades in ‘dominating’ everything. Some of this I attribute to ‘youngest child syndrome’ (he’s the youngest of 5) and trying to be good at something that everyone else has already mastered. Well, now he’s found his own area of excellence – he’s a whiz on the guitar – and all the rest are cheering him on. Enjoy the ride! I love it. I can’t wait to see who Nicholas becomes. Funny, I see Nico and Mikey both being in the military. Aw. So well written and so full of love. I am the clumsy one in my family, and I think my eldest has inherited this trait. My husband sometimes thinks it’s adorable, but at other times it drives him crazy — how can we bump into things all the time?! It’s just the way we’re made. Thankfully, it seems like we’ve also inherited strong bones. I really loved your tale of Nico and enjoyed getting to know him a little better through your eyes. What a sweetie! When I came home from my walk and found my husband on the front steps with his hand wrapped in paper towels…I just shook my head and went inside to get the first aid kit. No, they don’t! I think he got it from a video game he plays with my brother. It’s a car racing one, of course. Your boys are just the perfect brothers for each other. They are a great balance. They each bring something special to the family. I love this so much! I am getting ready to give birth to my second son in early April and I’ve been thinking about who he’ll be and in what ways he’ll be different from his brother. The way you love your boys is beautiful. 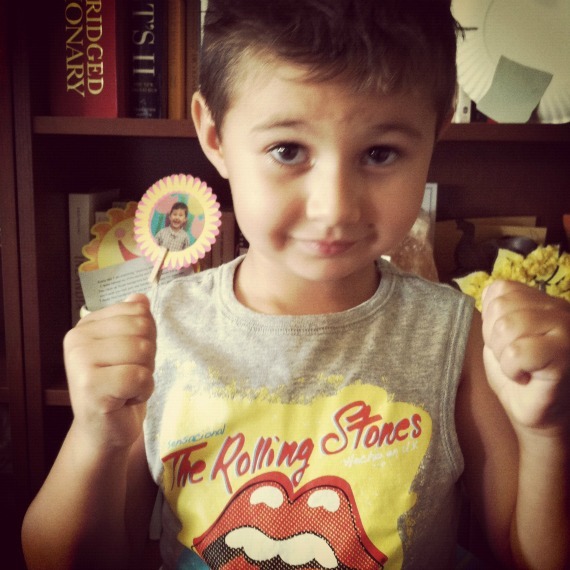 When I was pregnant with Nicholas, I wanted him to be just like Mikey. Now I can’t imagine him being so calm and introspective. Jules, I just loved this entry!! Beautiful!! I love this – my son is the cautious one and my daughter is the 911 baby. Isn’t it funny how they can be related and yet so individual. love him! he is very lucky to have a mom who gets him. you are doing a great job. I love the stories you share about your boys. (They make my heart happy even though I don’t know them personally) I also love how your observations (and theirs) remind me to look at my own peep with fresh eyes and enjoy all the things that maker her.. her. *Mine also loves to go about 120mph laughing & screaming and crashes. The nurse’s office at her school must have me on speed dial. I know my school office does! Everytime I see the school’s phone number I brace myself! LOL. The last one was a full run through mud and then a slip, slide, trip onto the concrete banging her head. Another time was a full speed run into the tetherball pole. She was playing tag, running from her friends laughing and looking backward at them and BAM, SUCKA… the pole won. My phone rang. Very time I see a picture of him I think of him saying “Holy Cow! I look awesome!” And you know what Nico? You ARE awesome!! Even I actually LOL’d at the “I just farted” comment. And I don’t envy you being mother to a child when “his skull appears to be intact” is the best you can hope for sometimes. I’m glad he has a parent that is like him, so you can look at your husband and reassure yourself that he survived to adulthood and Nico will too. I too admire people like Nico, and envy them. Despite the injuries, I think in many ways they have easier lives because they don’t torture themselves mentally the way people like us do. I always think those people have a much easier time sleeping at night than I do! This is so true. It’s what I love most about Nicholas. He won’t be the brother who is up late at night worrying. I don’t want that for Mikey, either, so I’ll have to work on his tendency to do just that! I thought Mikey probably was likely to be that way – I suspect he’s more like his mom in that? :) I know because I’m one too, and though I think we are awesome and accomplish great things, I do wish we could ease up on ourselves a little. This was fantastic! I love it. i have a sweet little nico-like boy too, with smiley triangle eyes and a forehead that’s seen some action and emergency rooms. every child is a precious little love. thanks for slowing us down and sharing. going to go kiss my boy again. and then maybe eat his belly. :) Aren’t little guys just fantastic? Your whole post made me smile. My mom is actually accident prone like that. She’s a “do-er” and sometimes does without thinking everything through. She and my dad are always going to the ER for some reason or another. Anyway. Loved the post. Such a cute little man you have. I love it when you write about your sons. Your nico sounds so much like my jake. 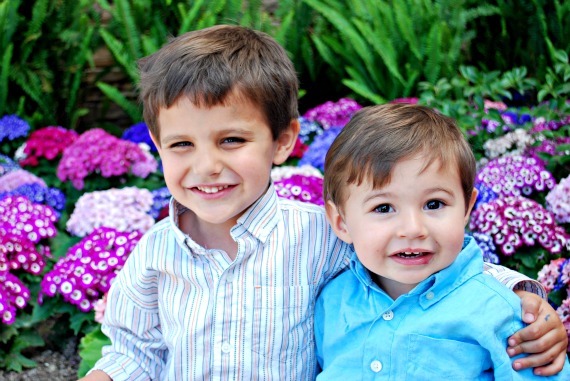 It is so much fun to be a mom of boys. Amazing really. They teach you so much. Ha! The dominator of farts…obviously he hasn’t met my husband. Kids really love there band aids don’t they? Any excuse to put them on. 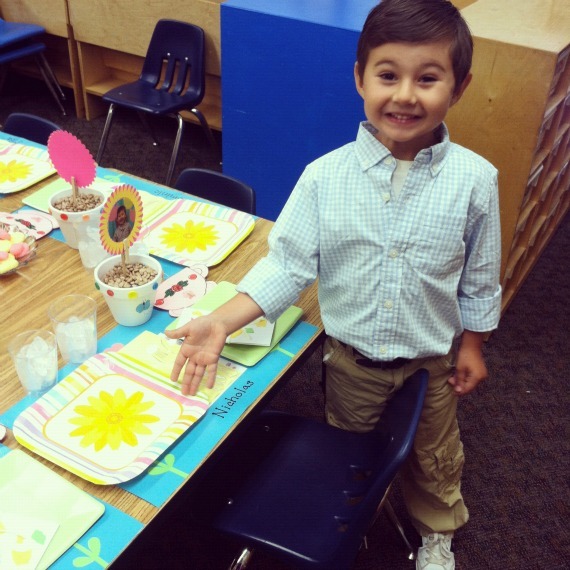 Nico is getting so big! You need to come for a visit. Also, the first photo? They were babies! I can’t take it. I hope you’ve got enough band aids in the house! Good Luck & I’ll keep reading – for sure! Who’d have thought a post with the word fart in it could get me so teary-eyed? Thank Heaven for little boys. 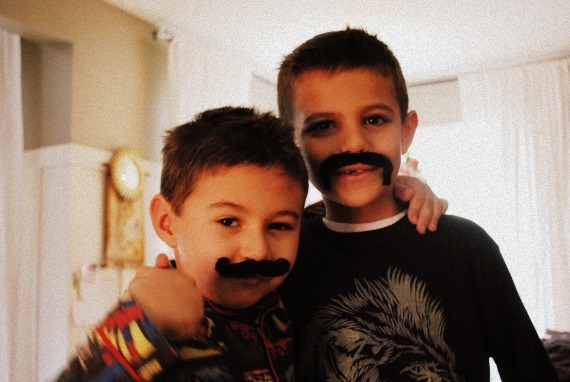 I think our sons are very similar. My second has busted his right bottom lip so many times that it doesn’t even bleed anymore – surprisingly, you can’t even tell he’s hurt himself in that area before when you’re looking at him. God bless you, mama. I loved this post. 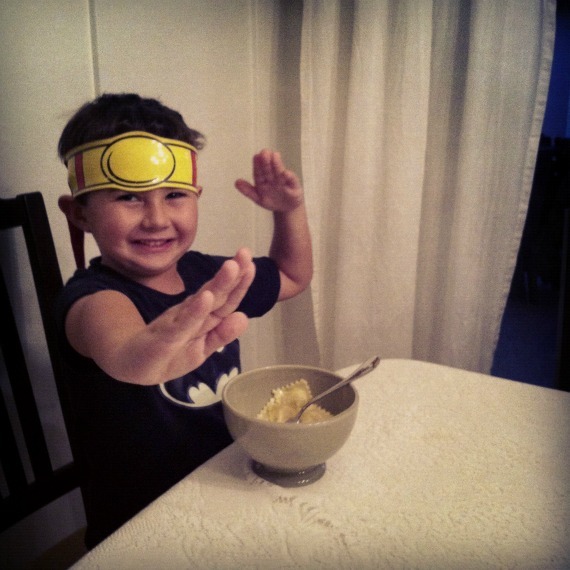 Just discovered your blog through “Minimalist Mom” – your writing is genius and I love the stories! You have a new reader. Greetings from Germany.